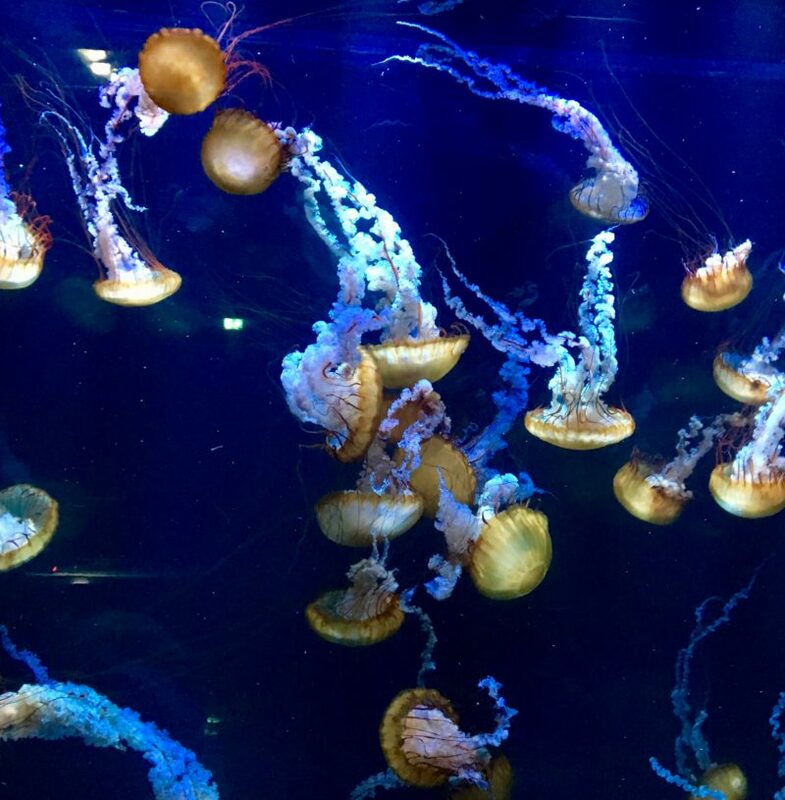 We were invited to visit NAUSICAA as guests for the purposes of this review. All opinions my own. As a single parent of two kids with a seven year age gap I have spent my fair share of times in aquariums. There aren’t a great deal of activities that both a 13 year old and a 6 year old will enjoy, but looking for fish that look like Dory and then saying ‘I found Dory!’ is one of them. That said, my aquarium experiences to date have always been disappointing. You pay about £40 for three of you to enter what promises to be an ‘under sea adventure’, to spend around 25 minutes, if you’re lucky, wandering around a dank basement that feels like it could do with a bit of a scrub down. You see some jellyfish – check, you spot the clown fish – check, and then suddenly you’re in the gift shop and both children want you to spend another £40 on a plush starfish. NAUSICAA is NOT like that. Imagine an awesomeness scale of all the aquariums I’ve ever been to. At one end of the scale is a sad looking goldfish and at the other end is a hammerhead shark. Most aquariums hover around the small, solitary octopus level. NAUSICAA is basically a mermaid, sat on a rock brushing her long hair while dolphins leap out of the water and a group of sardines performs a barbershop quartet style rendition of Somewhere Over the Rainbow. Don’t be put off by the fact that it’s in France as it’s really easy to get to. We took the Eurostar from St Pancras to Calais, which is only an hour, and then it’s around a half hour drive to NAUSICAA. 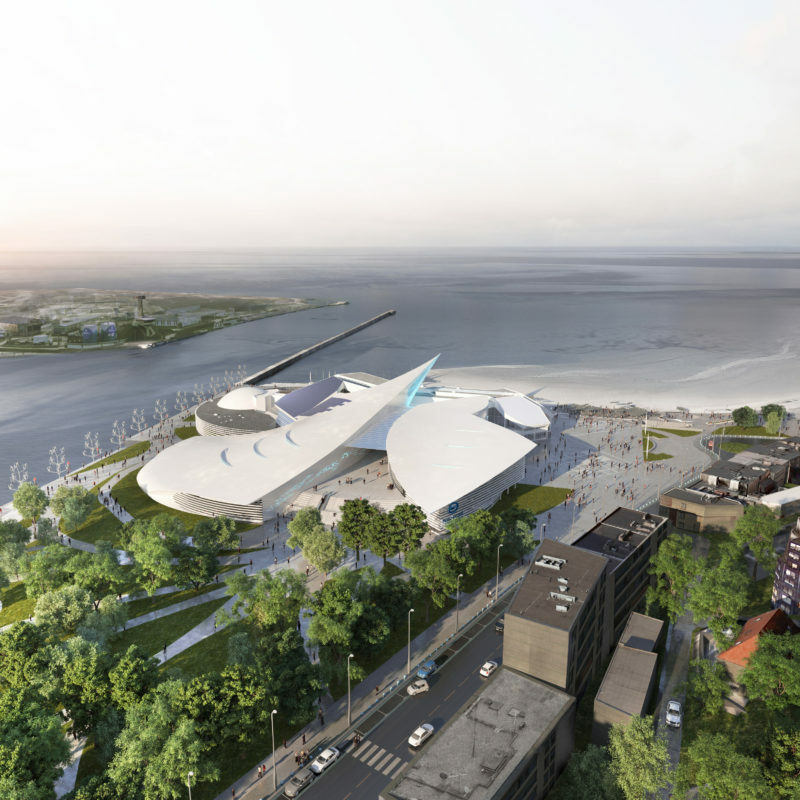 Even from the outside NAUSICAA scores points – the addition of the new extension was designed especially to make the whole building look like a manta ray. It’s tricky obviously to see this unless you’re in a helicopter or something, but keep it in mind. This part of NAUSICAA is more about the shores and the animals that live in more shallow water near our coasts. It looks a lot at humankind’s links with the sea and how we interact with it. 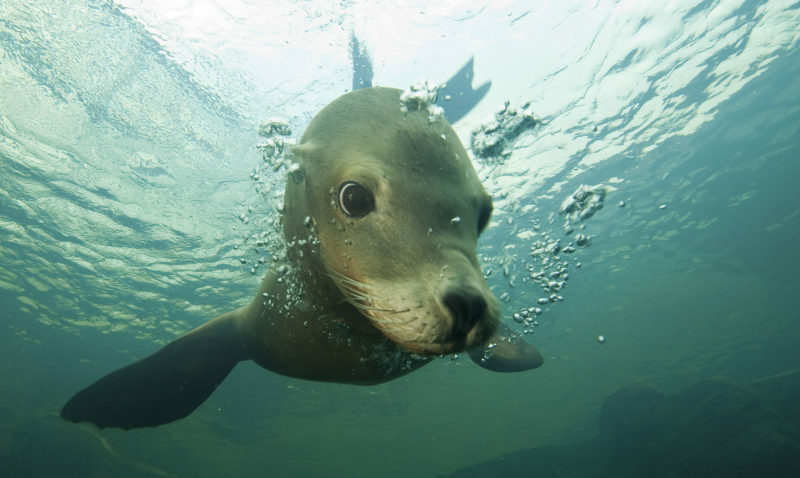 There are sea lions, penguins, jellyfish, sharks – it’s pretty awesome in itself and just this part would top any other aquarium I’ve visited. While we were there, several of the small sharks were being moved into a bigger tank in the new exhibit, which was very interesting to watch. The sharks have to be very temporarily sedated, and there was a team of vets on hand, as well as two divers in the tank with them, waiting for the tranquilliser on the first shark to take effect. We watched it all through a huge glass window underneath the tank. 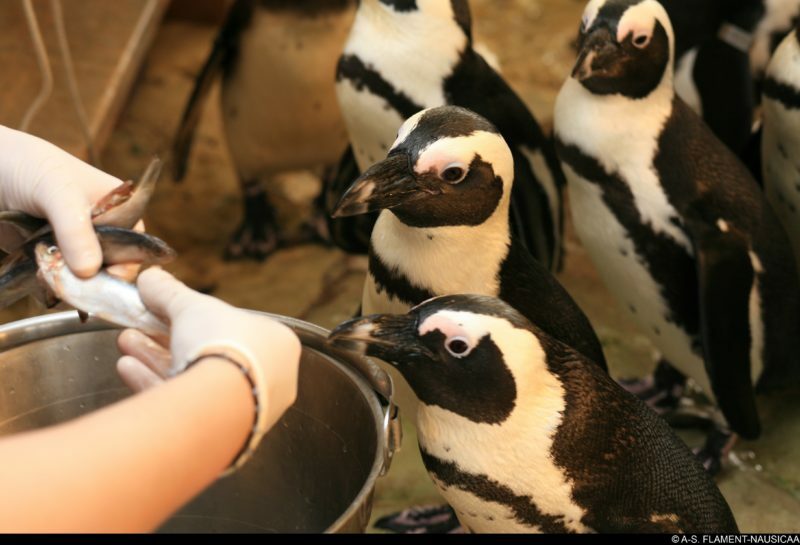 There are lots of opportunities in the shores exhibit to get interactive with the animals through feedings and talks with experts. 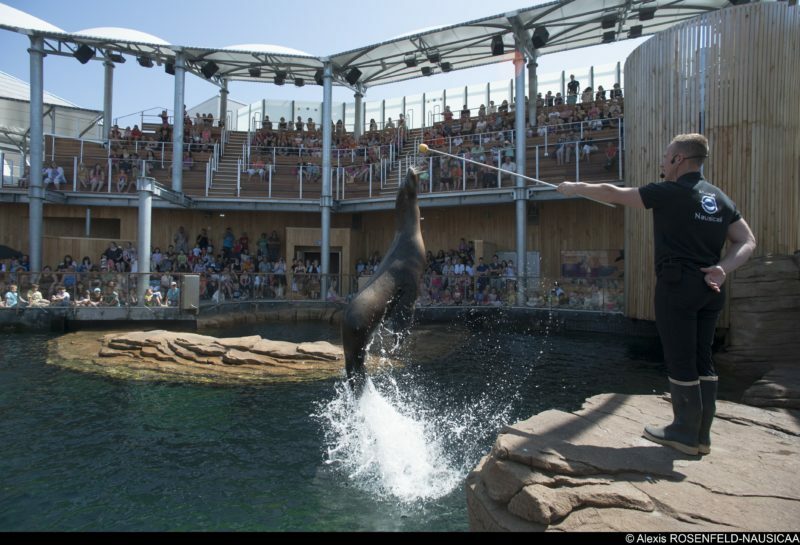 You can even watch the sea lion training in action. 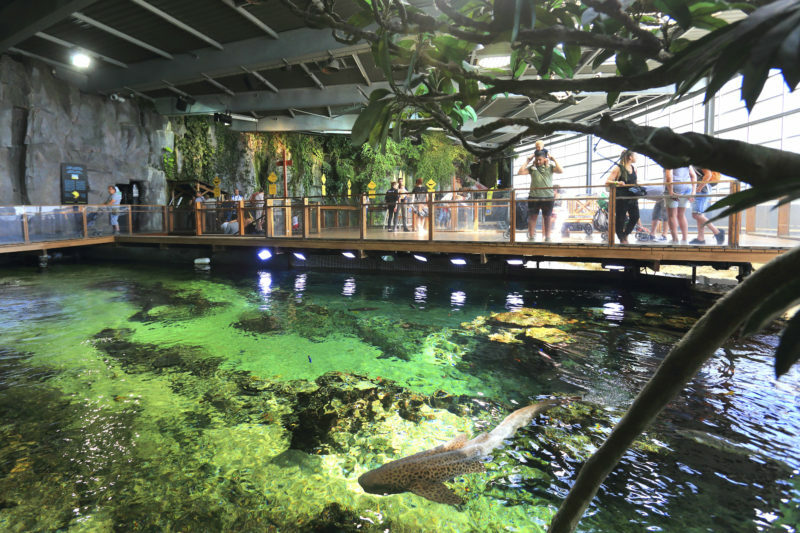 The new part of NAUSICAA, which only opened very recently, is focussed on the high seas – the deeper, more mysterious parts of our oceans that don’t belong to anyone. 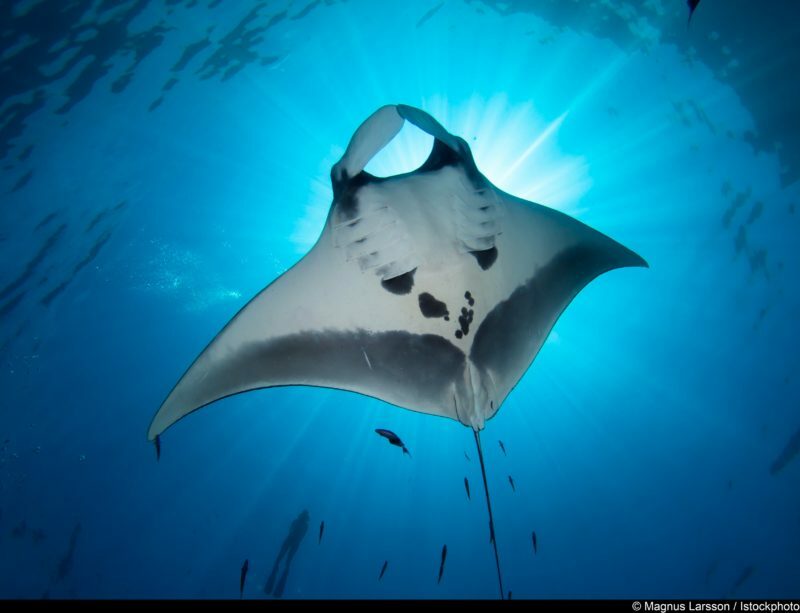 They haven’t been as widely explored but are home to an astounding array of life. It’s this new exhibit that takes NAUSICAA to the mermaid-dolphin-rainbow level. The first thing you see as you begin your descent into the depths in a big tank of jellyfish, or ‘wishies’ as we call them in our family. I know I joked earlier about jellyfish being the standard in an aquarium, but these were something a bit special. I could have stood here and watched them for a good ten minutes I reckon, if not more, only we had Stephane Henard showing us around – one of NAUSCIAA’s founders – and I figured he probably had more important things to do than watch me watch wishies. The way the new exhibit has been put together is very clever. You might not even notice it, but as you move through the displays you are getting deeper underground and the lights are getting dimmer, to mimic the feeling of going further down under the water. In fact, a huge amount of care has gone into creating a space that feels truly immersive. Tricks like mirrors, transparent floors, reflections and pivoting floors have all been used to disorientate you slightly, making you feel almost dizzy and weightless as you reach the depths of the ocean. Sound too plays an important part and there is a mix of instrumental music and original audio recordings used throughout. 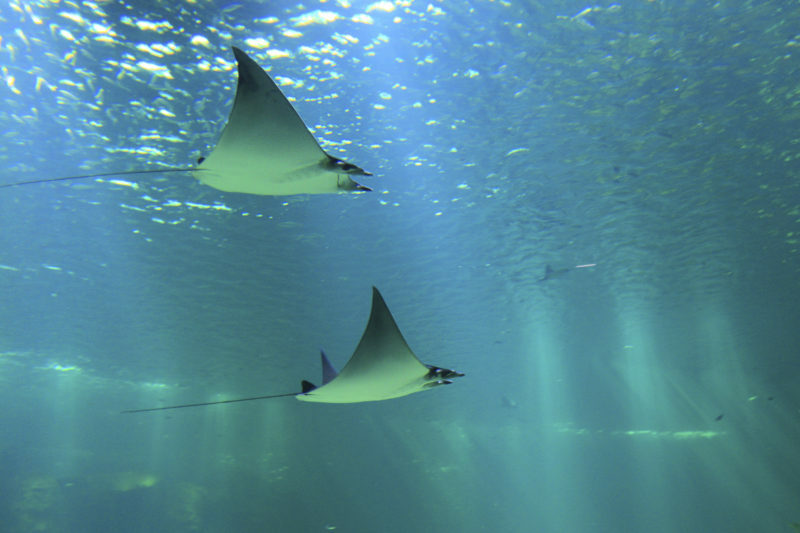 We tend to think of being underwater as being very quiet, but it’s far from it. One of the exhibits for example is cylindrical room with a 360° video of sperm whales. 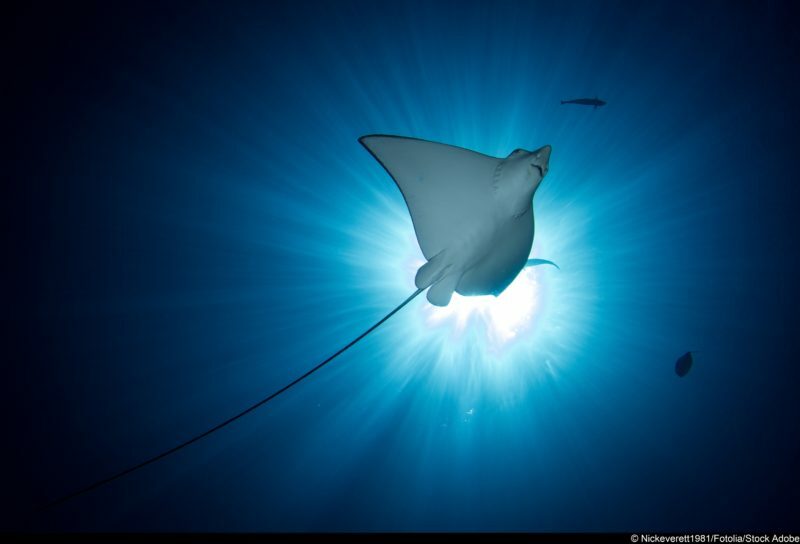 The incredible audio that goes with it is an original recording taken using submersible microphones in the Indian Ocean. The jewel in the crown of our metaphorical mermaid is the main tank in the high seas exhibit. 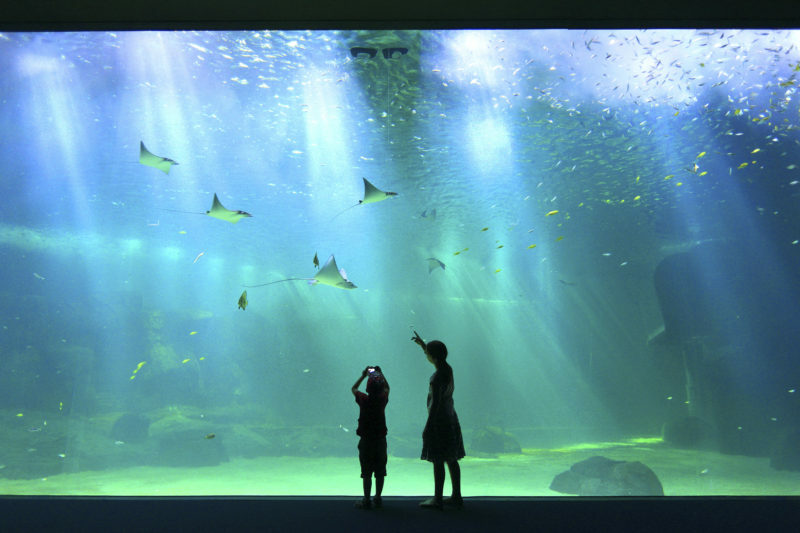 It holds 10,000 m3 of water and takes a whopping six weeks to fill, making it now the largest aquarium in Europe. You see it from various angles as you walk around the exhibit – including from above to get an idea of the workings behind it – but the ultimate view comes when you enter what is basically a huge auditorium. 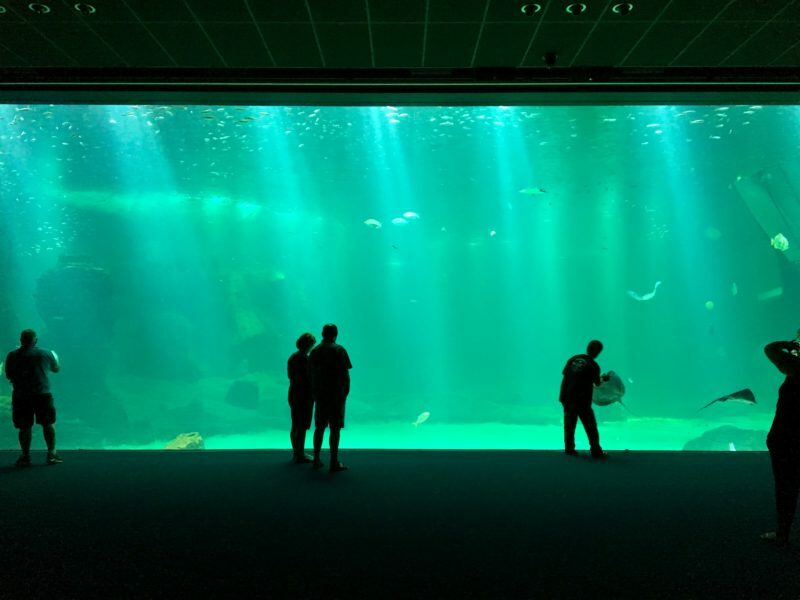 It reminded me a bit of going to an IMAX cinema – the side of the tank fills a whole wall and there’s tiered seating on the opposite wall so that you can just sit at a distance and watch it like a film. It’s hard with photos to give you an idea of the impact that it has as you walk in and see the 100m2 viewing panel for the first time. I found it absolutely breathtaking. I’d thought I could have watched the wishies for a long time but this was a whole new level of hypnotic. The water is pruposely slightly cloudy so that you can’t see the edges of the tank. It means that fish will seem to appear in front of you suddenly, as if from nowhere, much as they would in the sea. Apparently divers who have been in the tank say it is the closest feeling they have ever had to diving in open waters. The variety of fish in the tank is huge, and unlike other aquariums where you might see one type of fish in one tank and another in another, you get a real sense here of different species living harmoniously alongside each other, just like they would in nature. And what amazing species they are. 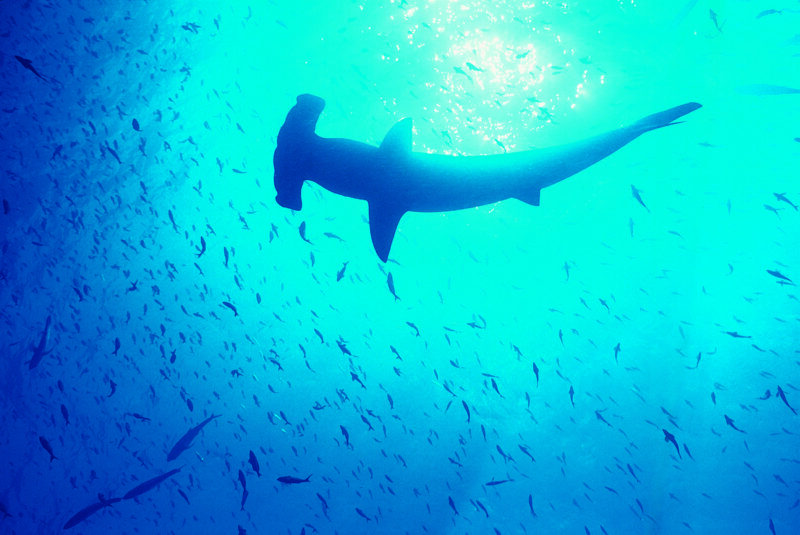 NAUSICAA is home to 1,600 different species in total, including 12 different types of shark. One of the really interesting things I took away with me in fact was just how pivotal sharks are, as the top of the food chain, to underwater ecosystems. There are hundreds of different shark species in the wild and they all play their own part in maintaining balance within our oceans. The overall effect for me was one of such grace and beauty. Kind of like the opposite of me trying to swim. Also, can you believe that these next two are photos of the same thing?? 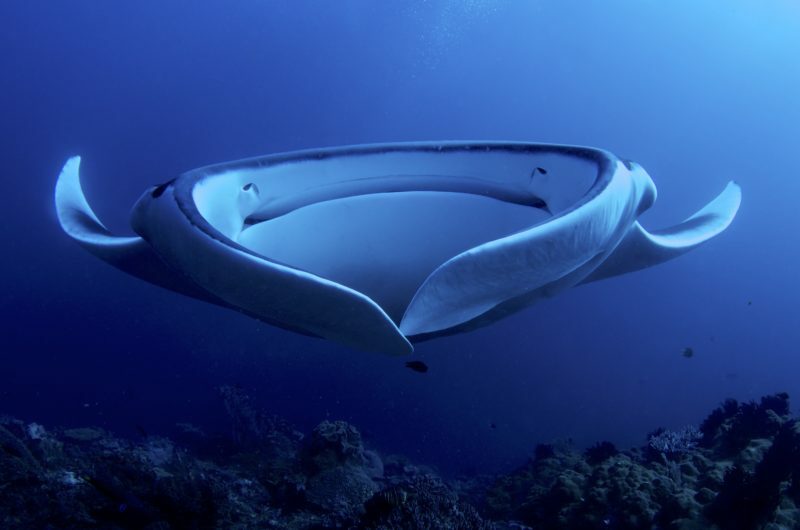 It’s a manta ray from below and from the front. As soon as we had left the room with the viewing panel I wanted to go back and I thought about it a lot as we walked around the rest of NAUSICAA. It sounds like a big thing to say, but I genuinely feel like it’s the closest connection I have ever felt to the sea. I not a big swimmer and I’ve never been diving or seen fish like that in their natural habitat, but at NAUSICAA I felt like I got a glimpse into what that would be like. I feel sure that I’ll go back again, if only to stand and gaze at those wishies. 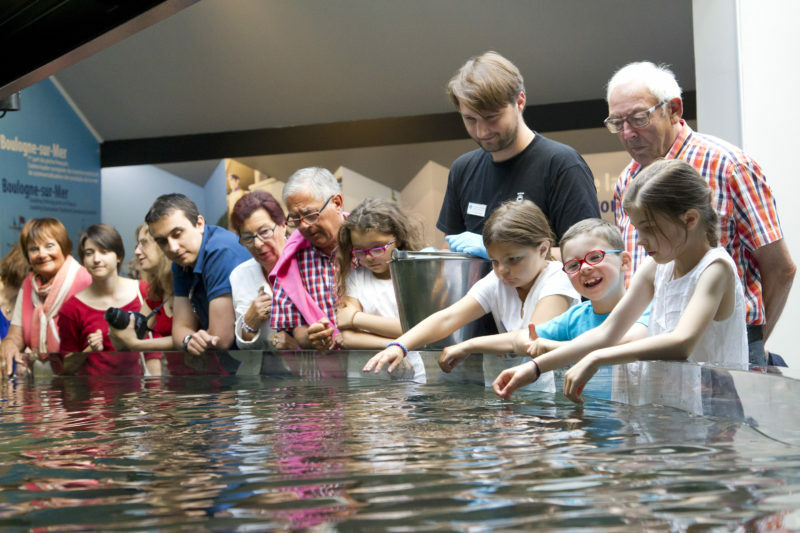 Plan your trip to NAUSICAA here. It was absolutely stunning Kay, I cannot recommend it highly enough!